I read with dismay when a young man compared death from preventable diseases to death from road traffic accidents and that all these were the will of God. There was a public outrage in Malaysia and that young man has since removed his post. I have no idea if he has repented but I believe ignorance is deadly and based on recent events, contagious. Indeed all men must die, but not all have to die stupid. I have a nephew who was born recently. I only get to see him on Skype daily. He lives in another country. I was looking forward to seeing him this year but due to the outbreak of diphtheria in Malaysia, I advised his parents to postpone their visit as my nephew hasn’t completed his vaccination schedule. My fears are not unfounded. This is the reality we are living in; where our lives are dictated by your decision. And your decision not only affects the present but the future that has yet come to pass. Beyond sense and reason which has failed in our communication with your kind, I ask that you try to employ one other method. Instinct. Do you instinctively feel that your child is safe without vaccination? Do you instinctively feel secure knowing that your child will recover regardless of the infectious disease that we have been trying our best for generations to avoid? Do you instinctively feel impervious to all manner of infectious disease because you are protected by powers beyond that is comprehensible to mere mortals? If you seek within the depths of your heart and find that it is difficult to honestly answer these questions, then you should listen to what I have to say. And listen well. I state the obvious first. I understand and empathise with those who feel that vaccines are dangerous as they cause a multitude of other defects which can be harmful and detrimental to health. Let’s assume that this is true. Are they worse than death or the defects caused by the infectious diseases which can be prevented by vaccines? Let’s start with polio which can cause disability and suffocation if it involves the breathing muscles. Assuming your child recovers from polio, he may never run or play like a normal child. Diphtheria affects your child’s breathing. In severe forms, it can affect the heart and nerves leading to death. Pertussis is known to cause violent, uncontrollable coughing which makes it hard to breathe for a child. It can be deadly for babies less than a year old. Vaccines prevent this infection by developing the immunity in your child by imitating the infection. This imitation does not cause severe illness but allows the immune system to develop its arsenal of weapons called ‘antibody’. In case your child is exposed to these infections in future, this antibody will prevent the infection from spreading to your child by eliminating the threat early and preventing your child from getting sick. If you know your ‘enemy’, you will be able to defeat them. It’s as simple as that. So the question that begs for an answer is this. Do you want to be facing these diseases alone or you want the vaccines by your side forming a protective shield? Or you sincerely feel autism is far worse than death? The choice is yours. A mother of a newborn child once told a friend of mine who was trying to convince her to vaccinate her child, that the reason doctors are adamant about vaccination is that they are making money from vaccines. You must be a special kind of human being in order believe this to be true. What you don’t realise is this. You have been poisoned and manipulated to despise doctors and modern medicine so others can make money from your fears and ignorance. Let’s assume your doctors are indeed making money from vaccines (which in most countries are given for free under their national health programme), are the alternative medicine practitioners doing it for free? I challenge you to do this; if someone comes to you and says that vaccines are a propaganda of certain individuals who want to take over the wealth of the world, just ask them if the alternative they are proposing is free. Are these dates, herbs and holy water ingested purely out of the goodwill of these practitioners without expecting any monetary payment in return? That will be the last you hear of their goodwill and sage advice. Since I can also be accused of writing this for monetary gains, let me state that I am an adult cardiologist and not one involved in administering vaccines. The most unacceptable outcome of not vaccinating your children is when they become infected and spread the infection to other innocent children. 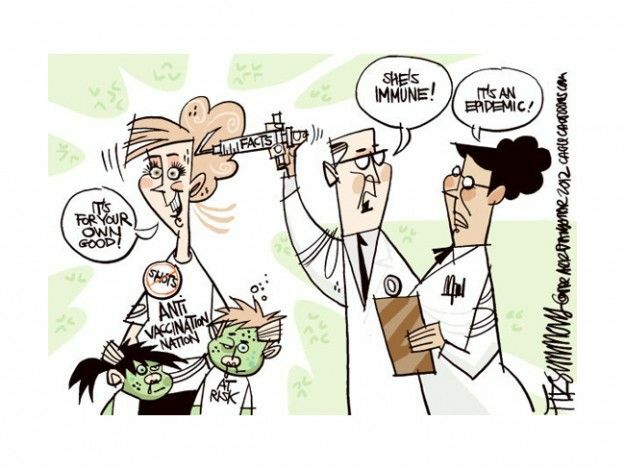 I am sure you have heard of the concept of ‘herd immunity’. We contain the spread of infection when vaccinated children form a barrier around others who cannot tolerate vaccination due to defects in their immune system. And some are too young to complete their vaccination schedule and as such, they are vulnerable to these deadly infections. Your decisions are responsible not only for the spread of these infections to your children but also countless other innocent lives. Have you spoken to your fellow anti-vaxxers whose children are dead or maimed after being infected? Have you seen any unvaccinated child recover and their parents tell you it was worth the experience seeing their child go through this? Have you forgotten that you live today because your parents made the right decision to vaccinate you when you were young? Unless you live on an island surrounded only by your fellow anti-vaxxers, remember that you don’t have the right to endanger the lives of other children. I will not vilify all anti-vaxxers of being greedy and evil. I know some of your intentions are pure. You honestly feel vaccines are more harmful than the diseases we are trying to contain, so you chose the lesser evil. Does it scare you when your child develops a fever after vaccination? It happens because your child has a healthy immune system which is now producing the aforementioned antibodies. Does it frighten you to see the rise of autoimmune diseases, environmental allergies, life-threatening food allergies, ADHD, seizure disorders, asthma, and cancer? But your grandparents were vaccinated and so were you. Why now the rise? Why can’t it be due to the processed food and unhealthy eating habits? Why do you steadfastly hold on to the belief that vaccines are responsible? Do you have any credible studies to back you up? Some use the word of God and religious texts to counter the logic behind vaccination. Regardless of the religion you practice, God is merciful and kind. He would not want you to suffer when you already have the tools to save yourselves. Ignorance and ego are twin beasts that devour you from within preventing you from gaining sense and perspective. So I beg this of you, read and reflect on what I have written here. I am here for you and your children. I am not the enemy. And you are not mine. I want to live in a world that is safe for all children. The world where I am not shackled by fear and trodden by the injustice inflicted upon me by others. It is as Thomas Sowell once said: “It takes considerable knowledge just to realise the extent of your own ignorance”.